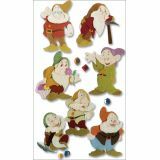 Disney Dimensional Stickers - EK SUCCESS-Disney Dimensional Stickers. Add colorful elements to all your creative projects! This package contains one 7x4 inch sheet of stickers. Imported.